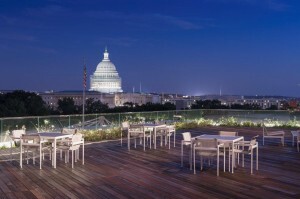 The Observatory at America’s Square is an extraordinary rooftop event space in the heart of D.C. overlooking our nation’s Capitol Building. 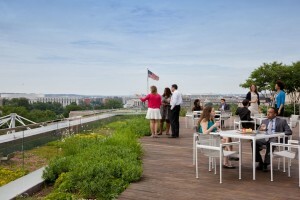 The terrace is fully equipped with restrooms and a catering kitchen boasting restaurant-grade appliances. It was built with state-of-the-art systems that can accommodate tents and electrical needs for event productions. We do not provide catering services; however we can provide a listing of our Preferred Vendors. Equipped with electrical for event productions. In-house discounted parking. Valet service available. Security, Engineering and Dock Master Services are included in the rental fee. There are two loading docks with direct elevator access to the Penthouse and two guest elevators with direct access from the building lobby. Completed in 2009, and designed by world-renowned architect, Lord Richard Rogers, 300 New Jersey Avenue is a striking building of glass and steel, light and space. The lobby is a spectacular greeting area for your guests. Accommodations have been made for a Brides Room.